Cortney Casey and Cynthia Calvillo is another fight that has been moved from UFC 233 to UFC on ESPN 1 and they cannot wait for their opportunity to perform on the ESPN broadcast. Casey is coming off three split decisions where she lost out to Felice Herrig and Michelle Waterson but is coming off a well-earned win over Angela Hill. Although Calvillo is ranked lower, she only has one loss on her record and that was a decision to Carla Esparza but she bounced back with a typical performance against Poliana Botelho. She was too strong and dominated the fight with her grappling putting the Brazilian out of her misery with a rear-naked choke. Casey is a natural athlete and very well-rounded but she may need a knockout to earn the win. 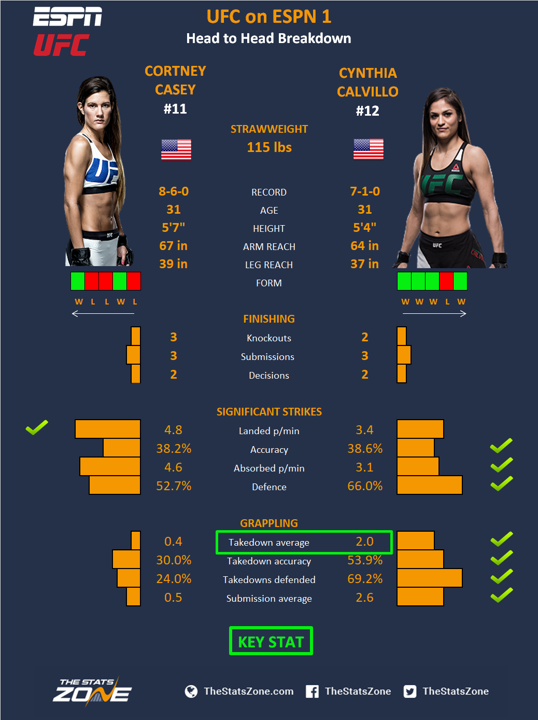 Calvillo is a better wrestler and will negate the reach advantage by taking the fight to the floor where she has dominated every opponent apart from Esparza. If Casey can keep moving, pepper Calvillo on the feet and avoid the takedown she has a chance but Calvillo’s wrestling is too good. Casey’s Jiu-Jitsu may prevent a submission but not a sixth decision loss of her career.